Just three sleeps ’til Christmas! How did this happen?! The last few weeks have absolutely flown by. Both Jon and I are working right up until Christmas day, as well as during the week between Christmas and New Year so our evenings are about to get very busy with last minute Christmas preparation. – Jars of peanut butter. I’m a fan of getting out the old sugar thermometer, having made my own marshmallows plenty of times before. 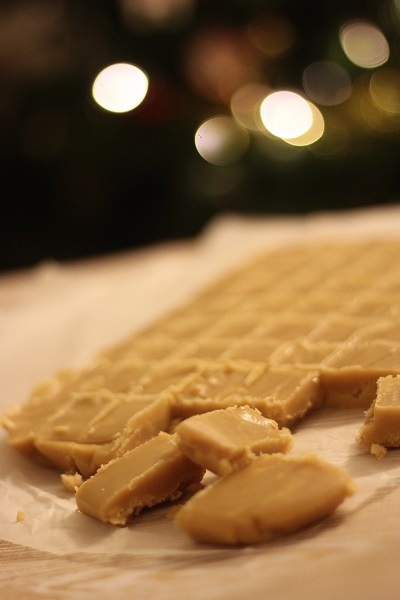 So, after raiding my cupboards for an old tin of condensed milk tucked away at the back of the cupboard, I got to making a big batch of vanilla fudge. One of the great things about this recipe for fudge is that it involves just 4 ingredients and takes about 30 minutes to make. It’s certainly going to be my go-to recipe now when I need a sweet treat at the last minute. You can make this classic vanilla fudge all year round but I love to add it to hampers at Christmas! Place all of the ingredients in a heavy bottomed non stick pan over a low heat until they have all melted together. Bring the mixture to the boil and then simmer for 10-15minutes stirring continuously. Keep stirring until the mixture hits soft-ball stage on a sugar thermometer (roughly 118 degrees C) or until the mix sets when dropped into ice cold water. Remove the pan from the heat and continue stirring/beating the fudge until it cools down and begins to thicken. Do this for roughly 10 minutes. Until it is cool enough to touch, is thick and glossy, but is still runny enough to be poured. Pour the molten fudge into a rectangular pan lined with grease proof paper. Set to one side and allow to cool completely before cutting into squares and serving. 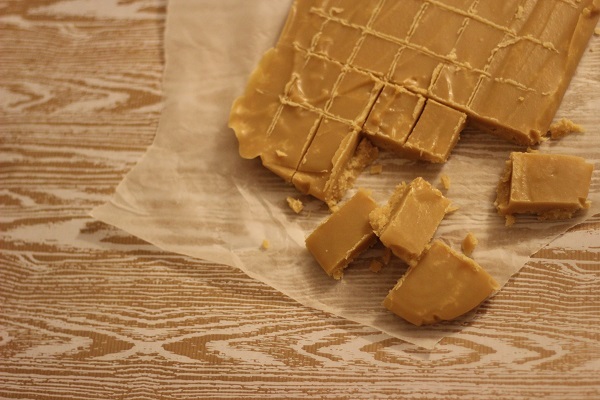 This is a classic vanilla fudge recipe so can easily be jazzed up a bit! Top tip: Why not add nuts, dried fruits or chocolate before pouring into the tin? You can also dip the fudge into chocolate once it has set. Do you put together hampers of baked treats for your friends and family? What kind of things do you include? Mine are often sweets and biscuits! You can never have too many during the festive season…I’d love to hear your ideas in the comments! Thanks! Tastes pretty good too :-p you should give it a go! Thats 30 mins of strring then??? Ok quick question where are you on the fudge continum? Tablety,Crumbly, chewy, gooey or melt in the mouthie? Mine ends up one of these each time i make a batch! This is melt in the mouthy 🙂 and pretty consistently so! 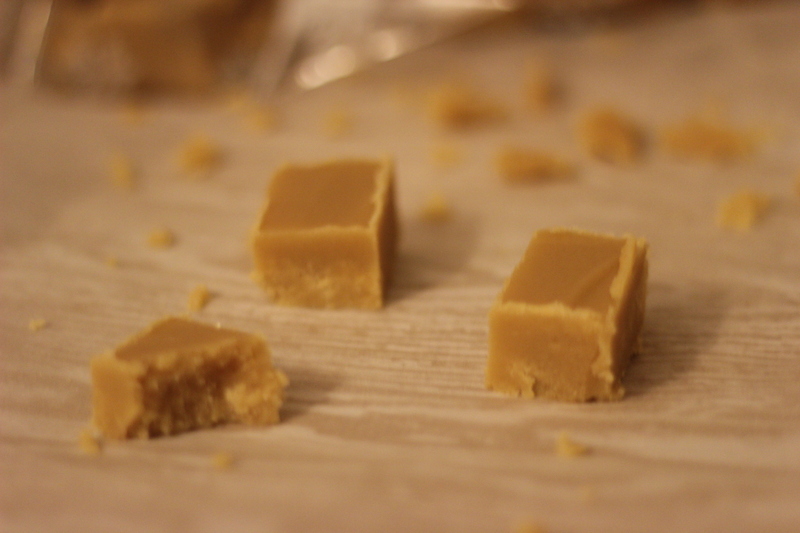 Though I do love tablet…will have to work out what’s different for making tablet next time!! Haha I like your thinking!!! 😀 the more fudge the better. Just made this, enough for a big slab of fudge, the taste and texture I love. I used an electric whisk to get it to the right consistency when the fudge was taken off the heat. I also used a teaspoon of vanilla extract as I had no vanilla pods, added when the molten fudge had cooled just a little but was still liquid. Sounds fab Jon. You’ve got me drooling! Glad you’ve enjoyed it 🙂 good idea using the electric whisk and swapping the vanilla extract in!